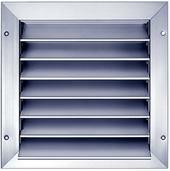 Weather resistant louvres are installed in air intake and exhaust air openings of building walls. They prevent rain and snow from entering. The well-designed screen grilles are made of colorless anodised alumium sections. Other colors on request. Bypass grille with stable, V-shaped louvers. The design chosen ensures perfect screening. May be installed in walls, doors etc.